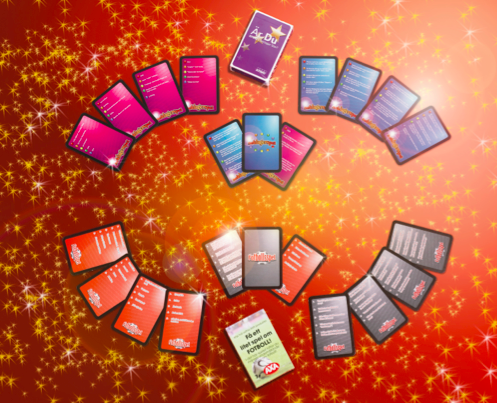 Cartamundi created custom made quiz concepts as a quick and easy solution for clients. Want to find out how we can help you ’quiz your brand’? Check these inspiring cases. Who does not love to participate in a great quiz game once in a while? It is fun, it is challenging and you always walk away with new insights and knowledge. In Sweden quizes are really ’a thing’. Some people will take their friends and family out to the beach and quiz for hours. That is exactly what inspired Cartamundi Nordic to create custom made quiz concepts as a quick solution for clients. If you are looking for a fun way to promote your brand, this could be a little something for you. We offer a custom made tuckbox with Q&A cards of different categories inside. The cards will show your logo or brand design on the back. If you want brand related content added, we can always create an extra quiz categorie about your company or about a topic you choose to say something about. Here’s two wonderful examples of quiz games we co-created with two interesting clients. One was Chiquita, the infamous fruit brand. We created an interesting set of questions in different categories like Geography, Sports, Football, Ice hockey, TV/Film, Eurovision, Food and drink, Gossip & Celebrities. For this campaign we added a Chiquita category, with all kinds of questions about the company’s story. With Norrlands Guld, the Swedish lager beer brand that is all about chilling out and being true to yourself, we created something different. They wanted their Q&A card game to brighten up people’s summers. So they went with categories about music, and connected with a lot of youngsters by doing so. Both these cases proof how Cartamundi can help you bring a simple yet very effective campaign to the market. By just adding quiz concepts that are timeless, fun, attractive, and easily adaptable to your specific brand. Let us know if you feel like this could be something for you. We’ ll help you find out how to ‘quiz your brand’.